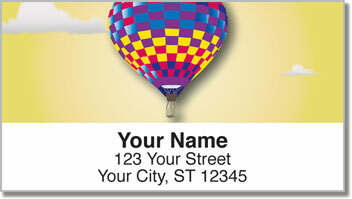 Brilliant illustrations of hot air balloons give you a great way to liven up your normally lifeless outgoing mail! 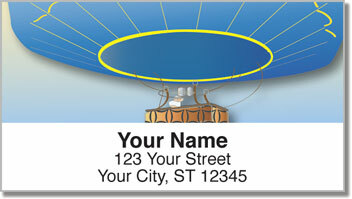 Hot air balloons are actually considered to be a class of aircraft. In fact, they are the oldest contraption to ever give humans the ability to fly! If you've ever floated high in the sky watching the world get smaller and smaller from your spot in a wicker basket - you know why people still fly balloons. It is exhilarating! 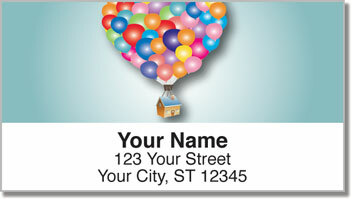 Balloon Ride Address Labels are an excellent finishing touch to letters and packages. But they will also help you quickly complete an everyday chore. Since your new labels are self adhesive, all you have to do is peel and place them on every envelope! 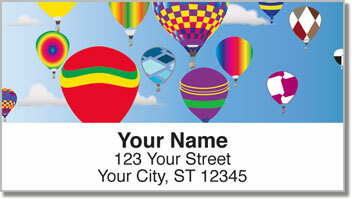 Get your own Balloon Ride Address Labels today! Order them with matching personal checks.